A Tutorial: Blue Tears and Orange Wings (kind of), PLUS Swatches from Shiro! 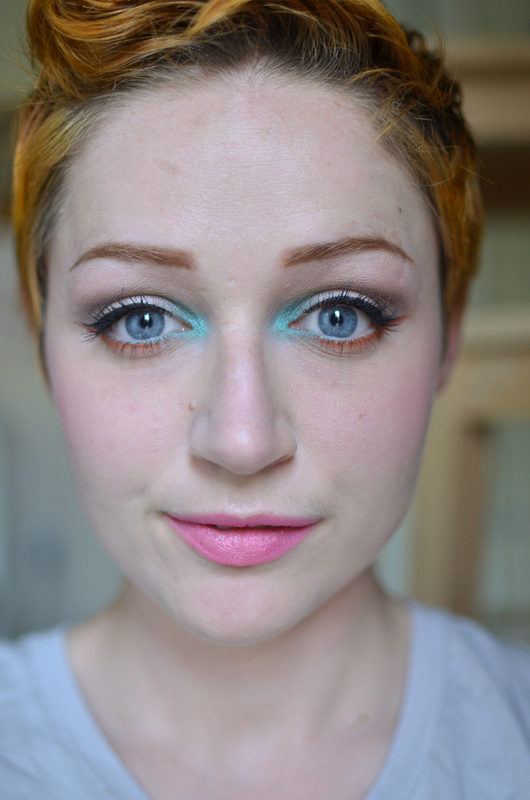 I was inspired by Rebecca Shores’ recent Color Theory for Makeup post (and honestly by all of her incredible looks), especially her ingenious use of pop colors in the inner eye corner. I wanted to do something that utilized this, utilized some bright, summery colors, and tested my lower eyelid shadow application. This coincided with a recent Reddit post from u/HobbitQueen that featured some killer suggestions for rocking statement blush. It occurred to me that since I have a camera, I could indeed take way too many pictures of my entire process of putting this stuff onto my own face, and that other people could perhaps do the same thing by looking at these too many pictures. Additionally, I have swatches of some great Shiro shadows I picked up! Let’s do this!